Viber, SnapChat, Facebook Messenger, Instagram, WhatsApp, Skype; there is no shortage of apps you can use to let your friends know where you are and what you’re thinking. But these companies aren’t the be-all and end-all of the messaging app market-far from it. This week we’re proud to bring you 3 new messaging startups that we think you might learn a lot from, whether you’re already an industry player or just thinking about building your own messaging app. Without further ado, here are Huckle, Waldo, and Cord. Huckle is a student-oriented, location-based messaging app that promises to make big waves as it spreads to college campuses around the U.S.
Boasting the ability to automatically create and update groups of friends and fellow-users according to where they are now, Huckle is a clever way to arrange your social life without spending a ton of time coordinating with your buds. Well we’ve got three little reasons why we think Huckle is worth checking out. 1. Huckle automatically updates information about where your friends are, which means you never have to send a “where you at, bro” text again. Simply open the app and see where your friends are, and who they’re hanging out with. 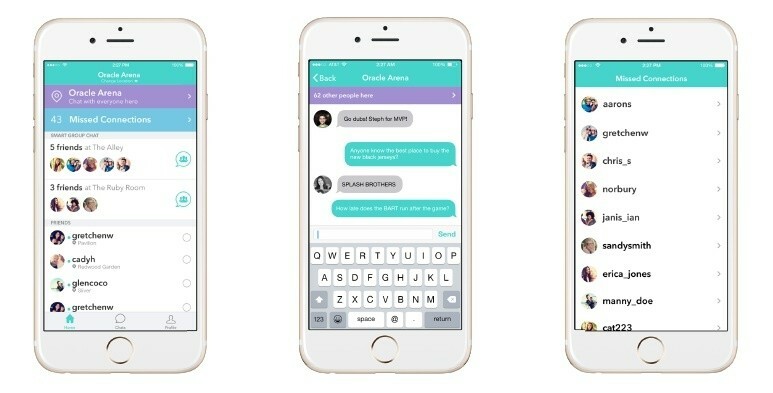 You can send a group message to your friends chilling at Greg’s place off campus, or to the dudes from your chemistry class who meet up after lectures at that Irish bar with the great fries. Huckle also automatically creates groups of users who share a given location like a dormitory, park, or club; this is a cool way to make new friends and follow the news at a University without having to deal with type of back-stabbing and downright meanness associated with gossip apps like YikYak. 2. Huckle has great features that allow you to be as social or private as you want. The app’s “party mode” shows you all of the app’s users in your area, and allows you to contribute to the group chat that Huckle automatically creates for a specific location. A “missed connections” feature gives you the option of adding people you spent time with recently to your circle of friends. If you’re not down for being social, though, no worries. You can just stick to messaging the groups of friends you created yourself. 3. Huckle is perfect for any environment in which large groups of people congregate, meaning that it has unlimited potential for growth. Why not use Huckle to meet people at a music festival, or like-minded professionals at a conference? Any start-up investor wants to know that your idea has room to develop. For Huckle, the skies are the limits. Huckle was founded in 2014 by Berkeley based duo Jordan Stone and Greg Hill. So far Huckle has received over $250,000 in investments from, among others, Jason Calacanis who you may remember as an early investor in Tumblr and Uber. You can download Huckle now for the iPhone. While its tagline may make it sound a little creepy in a “Big Brother is watching you” sort of way, Waldo is actually an ingenious way to keep tabs on those you hold near and dear. The app is a self-described “contextual messenger” which runs in the background of your device. Waldo knows where you are and what you’re doing-driving, working, working out-and makes it easy for you to update your friends on the details. In a mobile landscape cluttered with messaging apps, we think Waldo is worth seeking out. Here’s why. 1. It is a passive way to keep apprised of what your friends and family are up to. We all love to know what the people we care about are up to, but it’s honestly pretty annoying to have to ask and answer the same questions-“where r u?,” “what’s up?”, “r u busy?” over and over again throughout the course of your day. Waldo saves us the trouble of having to touch base with friends by updating a users’ status in the app automatically. 2. Waldo isn’t for everyone . . . and by that I mean your profile won’t include updates from the 100s of friends you have on Facebook. Instead, it’s ideal for keeping tabs on a small group of very active people, which is another way of saying the modern American family or your 3 closest friends. So many messaging apps are about expanding your social network that it’s refreshing to see one that emphasizes building tighter connections amongst a small group. 3. Waldo tells you what you need to know, but not more. This app isn’t the place to go to find out someone’s favorite band or American Idol contestant, but it does tell you the kind of information you wish every messaging app did, like that your friend is currently driving or that his/her phone is running low on batteries. Waldo is made by Chronos Mobile Technologies, a development company headquartered in SF which specializes in lifestyle apps, and is currently available for the iPhone and Apple Watch. Cord, a super simple app for Android and iOS that lets you listen to and record 12 second messages from friends, is a delightful contrast to the bevy of Swiss Army knife-like messaging apps that seem to competing for first place in “Who has the most Features?” contest. No, it doesn’t have picture or video sharing, Google Maps integration or cute fox stickers, but this minimalist Android and iPhone app does have charm-and a lot of it. Here are 3 reasons why we think you should download Cord . . . now! 1. The idea behind Cord is simple, and so is its UI. While other messaging apps make you scroll through long lists of contacts to find the person you want to connect with, this one presents a neat array of profile pictures for you to choose from. Recording and sending a voice message is as simple has tapping a friend’s picture for a couple of seconds, and playing one is just as simple. 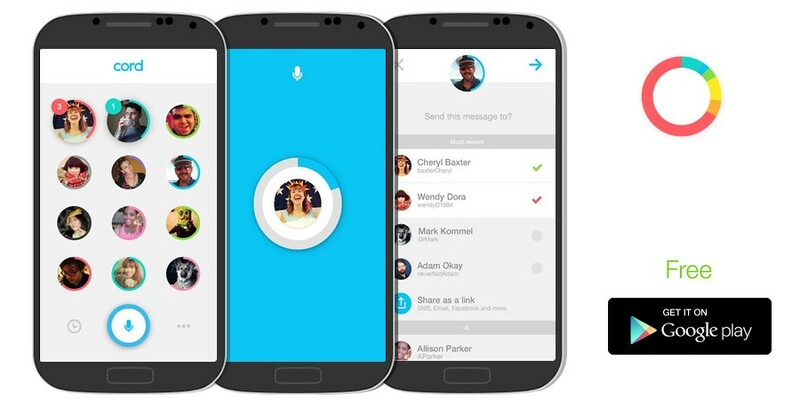 Sure, you can also send messages to groups of friends, but other than that there are no frills to weigh this app down. 2. Cord puts intimacy and emotion back into messaging. Everyone knows that text messages can’t express the range or depth of feeling as the human voice (which is often why we use them in the first place). This app presents a form of messaging that retains the ease and efficiency of text, but pushes us towards the personal touch of actually saying what we think out load. Let your voice do what emoticons used to! 3. 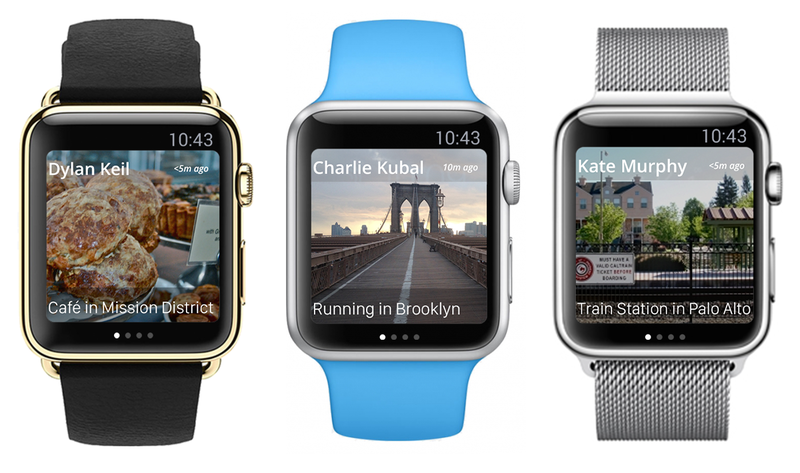 Its walkie-talkie-like nature makes it a perfect app for the Apple Watch. While other messengers have been forced to water down their apps’ functionality to suit the limited range of the Apple Watch, Cord is unique in that its users can do the same things with the app regardless of what device they’re running it on. Cord was founded by New York-based Google alums Thomas Gayno and Jeff Baxter, who have so far received over $1.8 million in funding from VC Firm VaynerRSE. If you’re thinking about developing your own messaging app, shoot us a message. We have the experience and creativity to make your app stand out from the crowd. What Startup Trends to Expect in 2015?